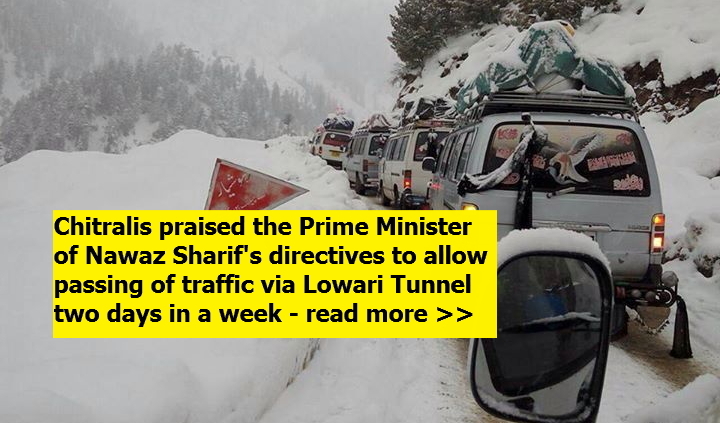 UPPER DIR: Passengers mostly Chitralis praised the Prime Minister of Nawaz Sharif's directives to allow passing of traffic via Lowari Tunnel two days in a week as hundreds of passengers vehicles had been passed through Lowari Tunnel on Tuesday. Following the Prime Minister's directives the NHA officials, district administrations of Upper Dir and Chitral and the Pak army announced in a press conference in Panakot army brigade headquarters that an additional day, the Tuesday, had been allowed for passing traffic via Lowari Tunnel. "Our people should also cooperate with NHA and Tunnel authorities and with district administration of Upper Dir and Chitral and show tolerance," said Farooq. He said that the district administration of Upper Dir had established helping points in Panakot, Belanzai and Maina Khwar and deployed levies personnel there. "These personnel also keep chains for wheels and would provide assistance to those vehicles which feel need," said Faheed.